Presented by Winona Forest Recreation Association. A Family Membership offers you, your spouse, and your children under the age of 18, the honor and privilege of being Winona Forest members. You will all receive your own membership cards, and gifts, as you do with the basic membership. Have lots of children? No problem. We are happy to offer you this membership opportunity regardless of the size of your family. We firmly believe that our children are the future of Winona. This level of membership offers you the opportunity to contribute at a higher level than the traditional membership. At this level, you are giving us the ability to update equipment, improve trails, and better our grooming capabilities. As an added perk – we would like to give you a free “Team Winona” T-shirt. 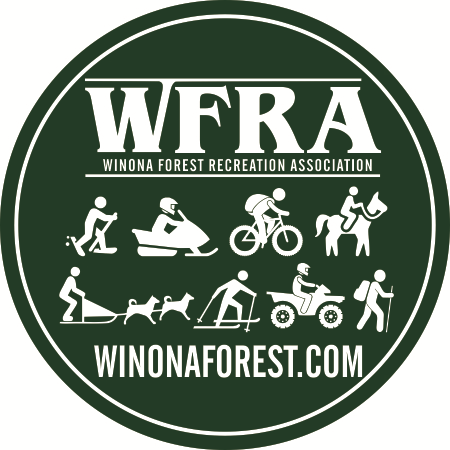 Winona Forest does not receive any money for maintenance, grooming and equipment purchases for non-snowmobile trails. All support comes from memberships and donations. Please support by making a tax-deductible contribution. Our distinctive club sticker highlighting all the recreational opportunities our club supports.